For the Dal-based Roméo Dallaire Child Soldiers Initiative, an important international meeting about its work and mission is simply another day at the office. Now, when your office for the day is the Vatican — well, that’s something different. 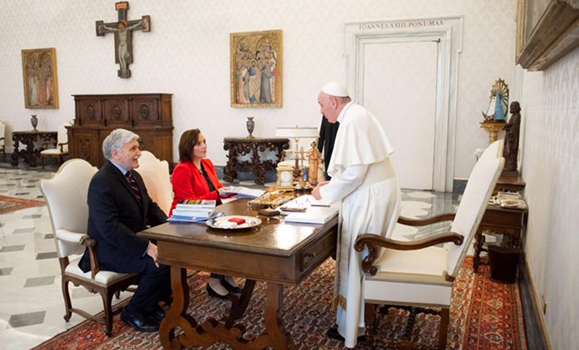 On Thursday morning (Jan. 17), the initiative’s namesake, Lt. General (Ret’d) The Honourable Roméo Dallaire, and Executive Director Shelley Whitman were granted a private audience with his Holiness, Pope Francis at the Vatican. They were there to discuss the initiative’s global mission to end the recruitment and use of child soldiers, including recent successes like the Vancouver Principles. The Dallaire Initiative partnered with the Government of Canada to conceive and develop the principles, which prioritize and further operationalize child protection within UN peacekeeping with a focus on preventing the recruitment and use of child soldiers. “We need moral leadership from all corners to raise this issue on the peace and security agenda,” tweeted Dr. Whitman. The Dallaire Initiative, first formed in 2007, is a global partnership that brings the perspective of the security sector to the issue of child soldiery, equipping leaders with the training and tools to prevent the recruitment and use of child soldiers worldwide. Its home at Dalhousie University situations the project within a uniquely rich, interactive and collaborative environment.